Last week I shared the benefits of providing a transcript in addition to captioning a video (an accessibility must!). But, short of transcribing each word yourself, how do acquire the transcript? Laura Fitton recommends SpeakerText – a fast and affordable transcription service. Weston Norton suggests CastingWords – the budget package offers transcripts at $0.75/minute. Do you use other tools or methods for creating transcripts? Share in the comments below. When creating transcripts for videos, adding details about the setting, actions and such may be beneficial to those relying solely on the transcript. Once the spoken word is captured, that text can be used to caption the video (again, essential for accessibility) and repurposed to create products in other formats. Definitely a win-win scenario! I have used overstream to add captions to the videos I’ve made. It’s a bit laborious, and that’s just with 2 – 3 minute videos, but I quite like the overall effect. Joanna, thanks for adding that tool. With overstream, are you then able to capture all of the text to repurpose it as a transcript? I don’t know – haven’t actually tried it. In accessibility terms should I offer a transcript too? Providing transcripts does make the content accessible to individuals who are deaf-blind, and offers other benefits. Captions are a must; transcripts are a “would be nice”. But, that is what drives me nuts. If you’ve gone through the laborious tasks of adding captions, then the application should make it easy for you to dump all of that text into a single file so that you can massage it into a transcript. A no brainer, really! I see this issue everywhere. 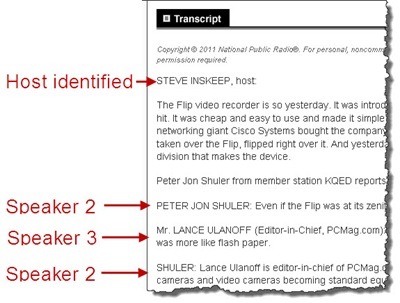 Take, for example, captioning a news broadcast: the anchors read from a teleprompter, which someone has written as text. Yet the captionist is capturing what is the anchor is saying. The result: captioning filled with typos as missed words. Why not give the captionist the written text, and then edit on the fly? What am I missing? I’ve used CastingWords many times and can also recommend them. Glenda, I discovered a new way of doing this which helps with at least some of it. If you type out a basic transcript using something like notepad, and then upload it to youtube with your video, it will add the captions for you without you needing to fiddle around with timings. It creates an transcript from that. You still need to get the basic transcript typed up or do it yourself, but this saved me loads of time compared to overstream which I had been using. I found it on this article – it’s the second option I used. Joanna, cool! Thank you for sharing that tip. I’ll give it a try.